“Geneviève Bergeron, Hélène Colgan, Nathalie Croteau, Barbara Daigneault, Anne-Marie Edward, Maud Haviernick, Barbara Klucznik-Widajewicz, Maryse Laganière, Maryse Leclair, Anne-Marie Lemay, Sonia Pelletier, Michèle Richard, Annie St-Arneault, Annie Turcotte. 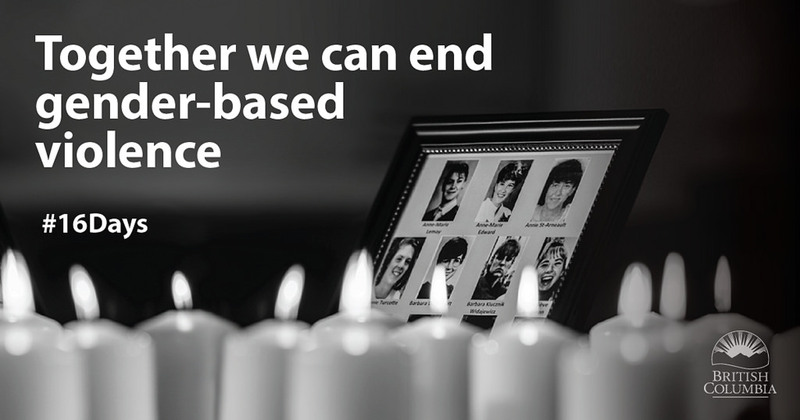 “Today, we say the names of the 14 women murdered at École Polytechnique on Dec. 6, 1989, and we remember their lives that ended in violence, stolen because of their gender. “Twenty-nine years later, gender-based violence and discrimination continue to happen every day, in places where we work, learn and live. “As we stand together and observe moments of silence in their honour, we recommit to using our voices and platforms to speak out, and to work together to end gender-based violence. A vigil will be held at 5 p.m. at the Parliament Buildings in Victoria to commemorate the National Day of Remembrance and Action on Violence Against Women. The Canadian flag will fly at half-mast from sunrise to sunset.